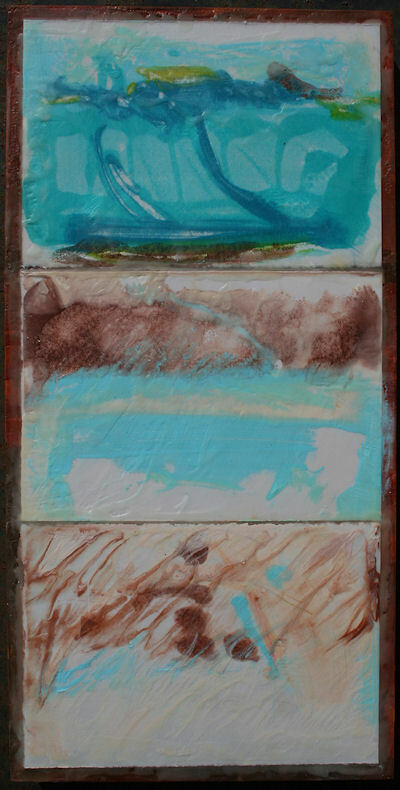 Earlier in the week, I had decided that three of the encaustic monotypes I worked on way back when I first got Paula Roland’s HotBox, were just perfect to mount on a new panel I had. It was serendipity that the 24 x 12 x 2 inch panel was perfect to stack the three monotypes with a little border around them. I added more wax to the backs of the monotypes so they would have lots of wax to “stick”, painted a background on the panel with the monotypes in mind. Then I hit a block when I began to get worried that these papers coated with so much wax would not adhere properly to the waxed board. My whole intent with getting the hot box was to use monotypes this way or to cut them up to use as collage elements. SO it was a real downer to think they might not stick well enough. I went online asking around and people came up with all kinds of good ideas. However none of them would work well with these paintings in my opinion. In fact I had already used some brass hinges on another piece I intend to let hang off the board but this piece just doesn’t call for anything else. SO… I gently heated the board surface, laid the pieces down, pressed firmly and then started building up the edges to come up closer around the paper edges. I think this will do it. I love the motion, gesture, flow and rhythm in these little pieces. I titled it, Tidepools. 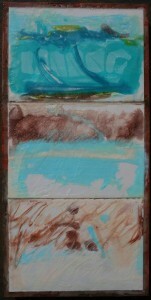 Tidepools, encaustic monotype triptych on wood panel, 24 x 12 x 2 inches.